Donna Sachet is the Ultimate Empress. 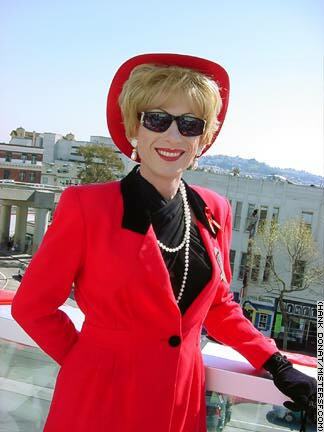 In 1995, the former Miss Gay San Francisco was chosen as the 30th Empress by the Imperial Court, a philanthropic community that celebrates self invention and the conventions of the Empress' ceremonial husband," Emperor Norton. Years after her reign, Donna can still be seen judging contests, emceeing fund raisers, cutting ribbons, and hosting parties throughout the City. A chanteuse, she has performed at The Plush Room, Castro Theatre, Great American Music Hall, City Hall, and Masonic Auditorium as well as venues in Washington D.C., New York, Los Angeles, Chicago, and Sydney, Australia. She has been awarded dozens of honors from the gay community including the 1996 Cable Car Entertainer of the Year and the 2000 Alice B. Toklas Lesbian & Gay Democratic Club Community Service Award. She is the founder of the long running "Songs of the Season" variety show, which raises thousands of dollars each year for the AIDS Emergency Fund. Donna has been honored by three San Francisco mayors and the Board of Supervisors for her work on behalf of the AIDS Emergency Fund and other organizations. Donna's vibrance and the breadth of her philanthropy have extended her goodwill beyond the Court community and earned her a place in the hearts of all San Franciscans. Here's what happened when Donna was photographed under the hot sun at the 2001 Folsom Street Fair - an admirer swooped in to hold her cover. Such respect is worthy of an Empress, worthy of Donna Sachet.